When homeowners want to remodel their Houston home, the most popular room is the bathroom. A simple way to modernize a bathroom is adding frameless shower doors. They are unique and provides a custom look and a bit of elegance to the space. Before considering installation, it may be wise to learn more about these accessories. Most shower doors require metal frames to keep glass in place. With traditional shower doors, glass is relatively thin, so the price is inexpensive. The downside is that the durability is low, and mildew and soap scum accumulate in the metal crevices. However, recent technology has allowed for advancements that do not require metal to surround the whole membrane. 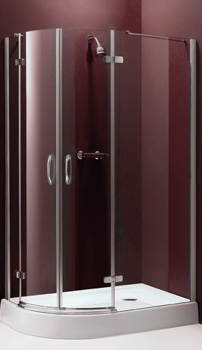 Frameless shower doors are the latest option and are available for standalone showers or total bathtub designs. They include bypass or pivot doors. Bypass doors slide, and pivot doors open like conventional doors. They are crafted from thicker tempered glass, which makes them much sturdier. The end result is an open concept that brings an airy feeling to a visually tight space. On average, frameless shower doors usually costs twice as much as traditional enclosures. Even though the initial cost is greater, frameless doors turn out to be less expensive when considering the long run. For instance, they are more durable and easier to clean. This means they will last longer and appear newer for many years. Also, if a person sells their home, frameless shower doors are features that increase overall value. When it comes time to give your home a facelift, the most popular room is the bathroom. It is a sanctuary where you can relax after a tough day. Bathroom upgrades also offer the best return on investment as well. Adding frameless shower doors are just the beginning. They open the creative decorating process. It is a nice time to incorporate other aesthetics to the bathroom including granite, marble, or other ornate tiles. With an elegant metal towel bar and door handles, there will be an illusion of floating accessories. To brighten the room even more, it is possible to incorporate a skylight or other windows. Placing plants and greenery throughout the room will make it seem as though the shower is in an adventurous, inviting jungle. Besides being more durable and easier to clean, frameless shower doors provide other benefits. For example, they let natural light to flow freely. When there is less metal in the room, there is an illusion of openness that allows natural light to reach every inch of the room. This means the color scheme can be darker without giving you the feeling of being in a cave. Also, frameless shower doors are the best option for minimalists. Few details get in the way of the room’s calming ambiance. There is no better time to update an outdated bathroom. This will create a space that is perfect for pampering and relaxing in solitude. Instead of using moldy shower curtains that are filled with bacteria, a better choice is frameless glass shower doors. They will open the space and bring a touch of class to the room. It is essential to choose a trusted company that will provide top quality installation and service. Apple Glass is proud to serve The Woodlands and Houston, Texas area. They specialize in auto glass repair and replacement, residential glass repair, and shower door replacement and installation. For more information on an affordable and practical way to upgrade your bathroom, please call us at 713-680-1400. This entry was posted in Frameless Shower Doors and tagged Frameless Shower Doors Houston, Glass Repair Houston, Residential Glass Repair Houston. Bookmark the permalink.